Sitka Gear Coldfront Gloves are guide-grade gloves built for the coldest and harshest days on the mountain. Pittard's Oiltac high-grip leather palms and a wet-printed nylon faces create a durable sheath for the fully waterproof and breathable GORETEX® inserts. High density fleece and Primaloft® Insulation work in tandem to keep your fingers toasty. Sitka Gear Coldfront Gloves are guide-grade gloves built for the coldest and harshest days on the mountain. Pittard&apos;s Oiltac high-grip leather palms and a wet-printed nylon faces create a durable sheath for the fully waterproof and breathable GORETEX® inserts. High density fleece and Primaloft® Insulation work in tandem to keep your fingers toasty. Gore-Tex provides the ultimate in windproof, waterproof breathable protection. Laminated construction stands up to the rigors of heavy use while remaining lightweight. 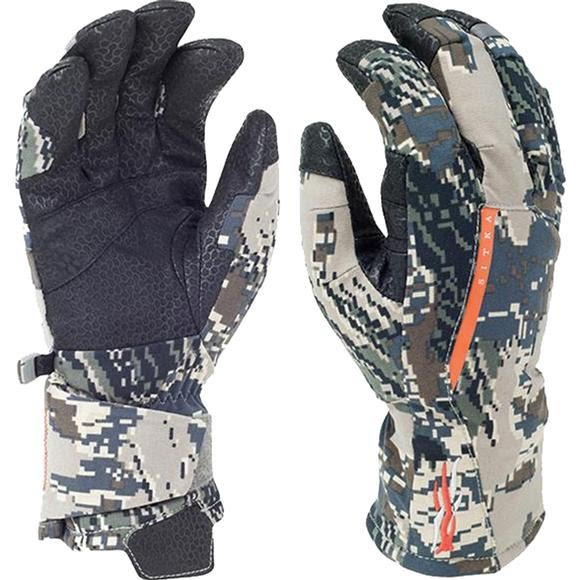 I purchased these gloves expecting them to be 100% waterproof as advertised, as well as keep my hands warm during tree stand hunts in Ohio winters. I am very happy with this gloves and I would recommend them. They fit very well and the fingers sort of have a curve to them so that they contour with the natural closure of your hand. Well highly out by Sitka. The trigger finger is not too big for shooting rifles and shotguns either. And you can literally put these on under running water and your hands will stay completely dry.